Raoul De La Bedoyere played an integral role in Events Committee at the Guild. Here Raoul provides a brilliant and fascinating personal insight to life at the Guild from 1978 /79. 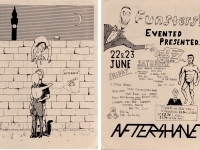 The natural beginning to my story is the collapse of the Events Committee at the end of the 1978, at the end of my fresher. The University I had joined had to be the uncoolest college in the UK. I had been a London punk then found myself exiled to the land that time forgot. 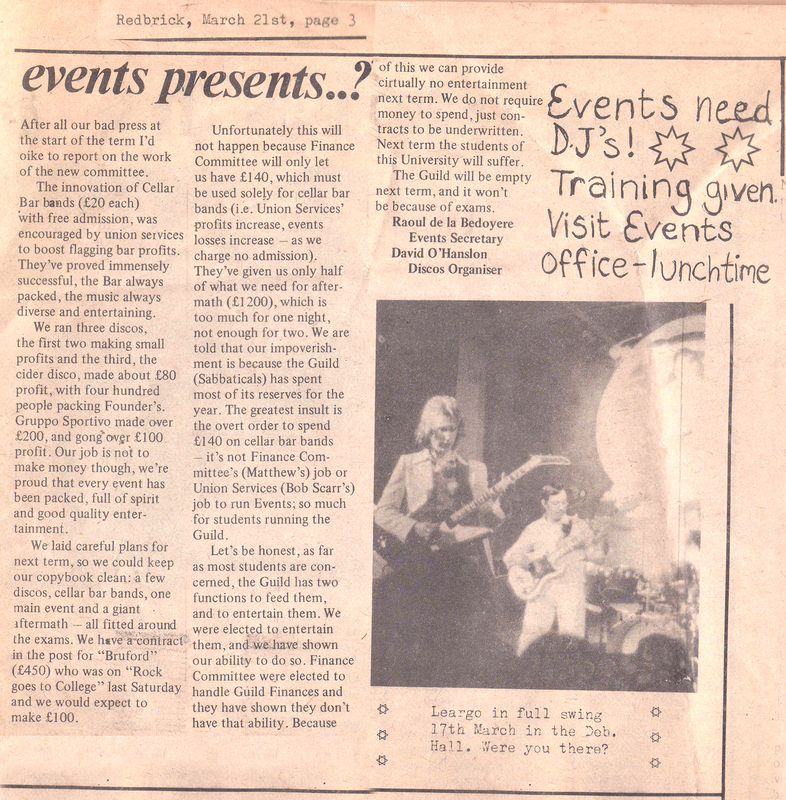 The Guild was largely run by aging hippy post grads and the events lot were a beardy, speccy crowd who loathed punk, disco, funk, soul and reggae. They loved real music and real musicians by which they meant the white mega stadium bands of the seventies. Unable to stump up the cash for Pink Floyd or even Camel, they had to fish in a very tiny pool indeed. Essentially from that ghastly genre known as ‘pub rock’ (which meant failed rock band) and ghastlier still -‘power-pop’ – a invention of a music industry desperate to recover the control they had lost to the punk scene. So in my first term I helped lug the p.a. systems of the Fabulous Poodles (novelty pub-rock, never charted), the Pirates (backing band on 1960 number one ‘Shakin’ All Over’, now a pub rock group without a record deal, Frankie Miller (unsuccesful Scottish singer songwriter, though did have a no.7 hit with ‘Darlin” that Autumn, whatever that was), Albion Band (folk rock outfit much loved by the BBC, folkies and nobody else), George Melly (early jazz/blues covers band), the Rubinoos (American power-pop wannabees who never had a hit). To the vast majority of students these acts were completely unknown and their music quite unlike what they heard on the radio or chose to buy. In the rest of Britain the music scene had been turned upside down by punk and its legacy, new wave, but in the Guild the unlovely hairy Eventers remained loyal to real rock music. Two or three hundred of the 8500 students would turn up to these gigs leading to spiralling losses and worse, a kind of dreary malaise and indifference. So at the end of my first term the entire Events Committee was sacked and the Guld Executive took over existing contracted dates. This left me in a bit of a quandary. I was one of the many freshers in those days for whom there was no place in Hall. To add to that there were only twelve students in my year reading philosophy, eight of them ‘mature’ students. The Guild was my only real social centre. 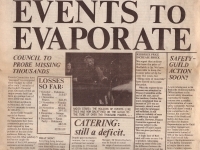 I had joined Events along with a fellow philosopher, Dave o’Hanlon, and now suddenly it had been dissolved, leaving only us, presumed innocent by the Executive. Having set the scene, my next message will describe how I took over Events and wrested control from the Executive and their dreams of jazz nights, and from the permanent catering staff who regarded events as just a way of selling more booze. So it’s the start of my second term at Birmingham in 1979, all the Events people have gone and there’s just me and fellow philosophy fresher Dave from Bradford. 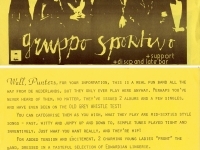 And there’s a band booked for the 10th February – ‘Gruppo Sportivo’. Up till then I had misspent my late adolescence in Wimbledon as an ex-public schoolboy getting into punk in 1977. While I retook my A-Levels my best pals were now students sharing a flat off the Kings Road and life consisted of decadent parties and pop-up gigs. 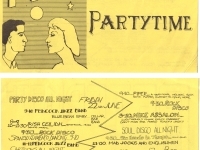 One night we’d be pogo-ing to Siouxie and the Banshees at the Vortex on Wardour Street, the next we’d be disco dancing at Crackers – actually the very same venue with a different name. Getting into Birmingham on clearing as a philosophy student was a bit of luck and really only proved how desperate they were. But with only five hours of tuition a week, even for a serial slacker I had rather too much time on my hands. Like a lot of freshers in that era we were in digs – lodgers in local folks’ homes. There simply weren’t enough places in halls of residence. The Guild was our only social centre and it was a graveyard, especially on a Saturday night when there might be no more than ten students drinking in the bars. Fed up I made a fateful decision: I couldn’t do any worse than the last lot – I would see if I could turn the Guild into the fantasy student hang-out I had always imagined from the movies. I gathered a group of similarly disaffected first-years to promote the hell out of the Gruppo Sportivo gig, leafletting and postering the whole campus and selling tickets door to door. Success! Not a sell-out but the biggest gate in years and a profit of £200! At some time in March we also had a gig with Pierre Moerlen’s Gong to promote. Not really the real hippy group but a noodily jazz-fusion offshoot led by drummer Pierre Moerlen. Pretty dreadful music but impressive gear to hump up the stairs. Got a big audience and turned a profit again. Typical of the legacy bookings we still had to promote was Leargo. One of the hundreds of rock bands touring the UK in those days, washed up by punk. Unloved and unrecorded and of course unknown to the students. I tried googling them today but all I could find was the ‘Lego Rock Band’. The upshot of the Gong and Gruppo gigs was we were heroes – a glowing example of what keen young volunteers could achieve and in complete contrast to the geriatric beardie post-grads who controlled the Guild. But three obstacles were looming which could still derail the project. The first was budget. There wasn’t any because the last lot had spent it all. The second were the veteran Guild hacks who thought they could now tell us youngsters what to do, basically book more of the same crap they thought was ‘real’ music. The third was we became a honey pot for ambitious hacks who saw their chance to take over the committee running this newly successful enterprise. 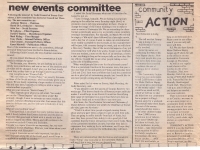 Come the latter part of the Spring term of 1979 Guild politicians noticed that the first-years running events had been very successful. Two major gigs had turned a decent profit and a whole new bunch of volunteers were putting in a lot of time to turn things around. Best of all here was an unprecedented opportunity to launch a career at the Guild without the trouble of doing any work. Every place on the Committee was vacant and best of all, the new Chairman would automatically take a seat on the Executive. Come the day of the Guild Council a troupe of faces put themselves forward to form the new Events committee. Almost all had never had the slightest involvement with it before but now each gave a speech in which they professed their commitment and enthusiasm. 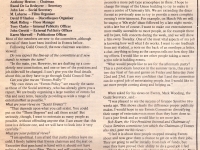 Within half an hour all but a couple of committee positions had been filled with union hacks. Most humiliating for me was the chairman election. To those in the know it was obvious it should be me because that was the job I was doing, and succeeding. Unfortunately in those days I had a terror of public speaking. When it came to make my speech I froze. It didn’t help that I looked about twelve years old. Ultimately I became the most powerful non-sabbatical hack in the Guild by any measure, but for me committee and executive meetings were always a bore, a rather unnecessary evil to tolerate in order to make the Guild a fun place to be. Real hacks wanted power for its own sake. Student hacks were and perhaps still are generally an unpleasant breed. What nineteen year old wants to spend their spare time sitting in committee rooms arguing over clauses and amendments? Basically creeps. These were almost to a man a breed of budding bureaucrats who did nothing to improve the students’ lot and were universally despised in return. Anyway, one of their number a podgy blonde boy by the name of Anthony Heaton stood against fear-struck me and won. 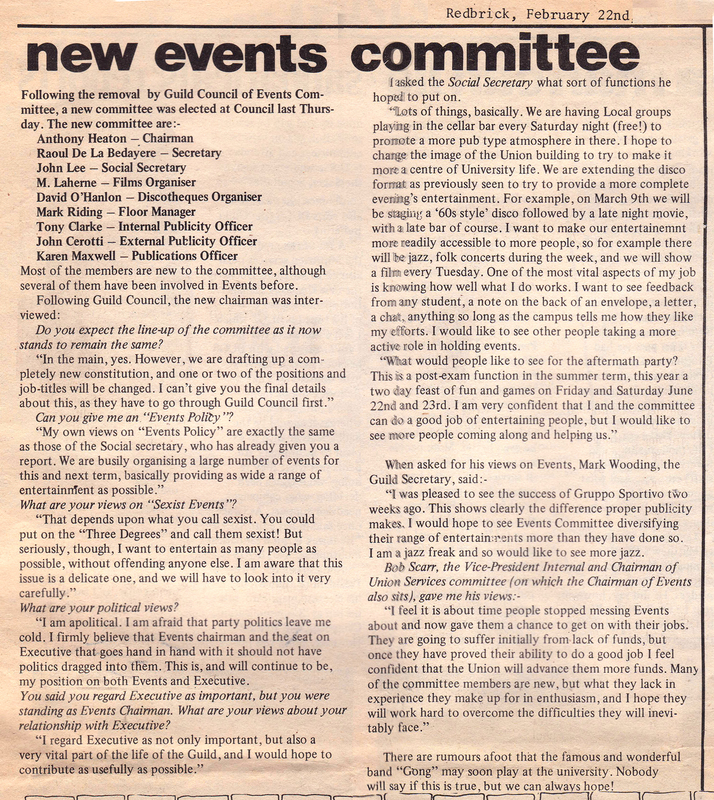 In the attached Redbrick piece ‘new events committee’ you can read Heaton’s thoughts. Notehis manager-speak and his references to the need for folk and jazz acts. We hardly ever saw this unprepossessing fellow again. Equally disastrous was our new social secretary. The flashy egotistical social secretary is rightly a stereotype. Johnny fit the cliché in almost every respect: he wanted the job for the status, for scoring girls and getting drunk and was utterly lazy, unreliable and feckless. He fulfilled those parts of the brief to perfection but unusually he had no interest in music whatsoever. The Soft Shoe Shuffle was in no way a hack but a great guy to know and party with. He stayed on for a year and a half before the beer did for him and then got sent down. Just an occasional and highly entertaining visitor to the Events office, John sometimes got cross about how his role was treated as a joke, but then acknowledged he he really couldn’t be arsed. Basically he was happy to have the title, enjoy the ride and bum around. As it turned out Johnny was a blessing because this allowed me, against the intent of the constitution, both to run Events and book the bands. Hugely popularat Uni and afterwards he showed himself not to be remotely feckless when it came to his own pocket. John became an entrepreneur and built a successful business in Leeds. Very sadly John died in summer 2014 soon after he had retired. With the exception of David O’ Hanlon I have no memory of the rest of that committee, who once elected soon disappeared. The rest of us carried on as before. In the summer term elections the farce was repeated. This time our new boss was a beardy fellow from stage staff called Simon Kahn, who was also gone by the end of the year. By the end of the term the hacks and hangers on had either resigned or disappeared. The first year cabal who had taken on the task of creating a Guild for the benefit of ordinary students like themselves, had won. What they had won was a ton of work: out of the 120 odd students who worked for events in their second year more than 15 would be sent down. Meanwhile, without a functioning committee and a budget Events fell under the sway of the Guild Executive and the Permanent Staff. They could and did determine the kind of events we could run until the end of my first year. 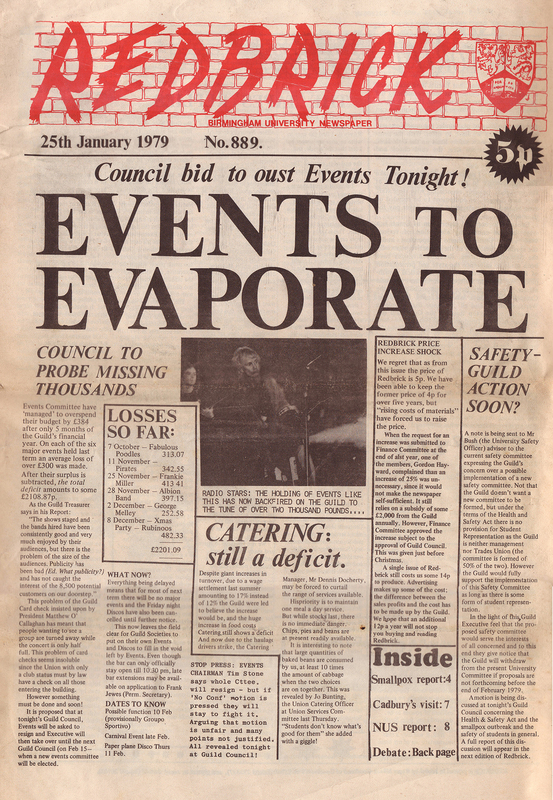 The Executive took the right of veto over which bands to book, forced us to run events to appeal to hypothetical minority audiences and put on free events to prop up bar takings. I was surprised to learn that a popular idea amongst Guild hacks was that we would be more successful if instead of rock/pop acts we promoted folk, jazz, poetry, classical ensemble and art film events. Given that these were both by definition and in practice of minority interest and, that in the outside world, apart from global stars were never commercial, the notion seemed daft. We had a constituency of 7 to 9 thousand people aged 18 to 22 – the easiest audience to satisfy, but not with a string quartet or an anonymous jazz band. My resistance to the ‘Jazz Tendency’ was certainly not aesthetic. That year I saw both Miles Davis and Muddy Waters in Birmingham and was a regular at the Arts Centre cinema. Didn’t spot any other Brum students in the audience. I loved Hendrix, Motown, the Damned and Carmen for the hell of it, in a way that is today normal but then perverse. In those days the Guild had a records lending library. In it I found rare LP’s by Charlie Parker, Coltrane, Thelonius Monk and Miles Davis. None had been borrowed for twenty years. I swiped the lot and still have them today. They may be some of the most valuable records i own. Big deal. The real deal was that some of the greatest bands of the century were forming or performing around Brum at the time, unbeknown to the Guild bureaucrats. I saw the Specials, the Clash, Dexy’s, Iggy Pop and Magazine in small Birmingham venues that term. The hacks simply had no idea about normal student life. Another problem was that Birmingham was an incredibly nerdy university in those days. It attracted a lot of very earnest middlebrow characters who had spent their teenage swotting for the dream. The nerdiest of all were the hacks. They hid their ignorance of popular culture behind a professed enthusiasm for the more respectable arts. To give them some credit they had also witnessed three years of sustained failure of the rock/pop formula. In fact, rather like the old Events Committee, they confused unsigned, unimaginative has-been local rock bands with popular music. What the students wanted was Pink Floyd, the Jam and Blondie – but they weren’t available. Over the next year, under pressure I did book examples of all the afore-mentioned genres, everyone a flop and notable for the absence of the hacks themselves. I had plenty of flops of my own but these events aimed at minorities were doomed from the off. Those hacks elected to oversee the restaurants and bars in the Guild decided that the remaining Events budget should be spent putting on bands for free on a Saturday night to prop up the bar income. To my mind this was a dishonest sequester of union fees to subsidise the drinking habits of the tens of students hanging round the bars. It didn’t help that the available bands were dire and had no pulling power. There’d be more people in the bar than the gig itself. 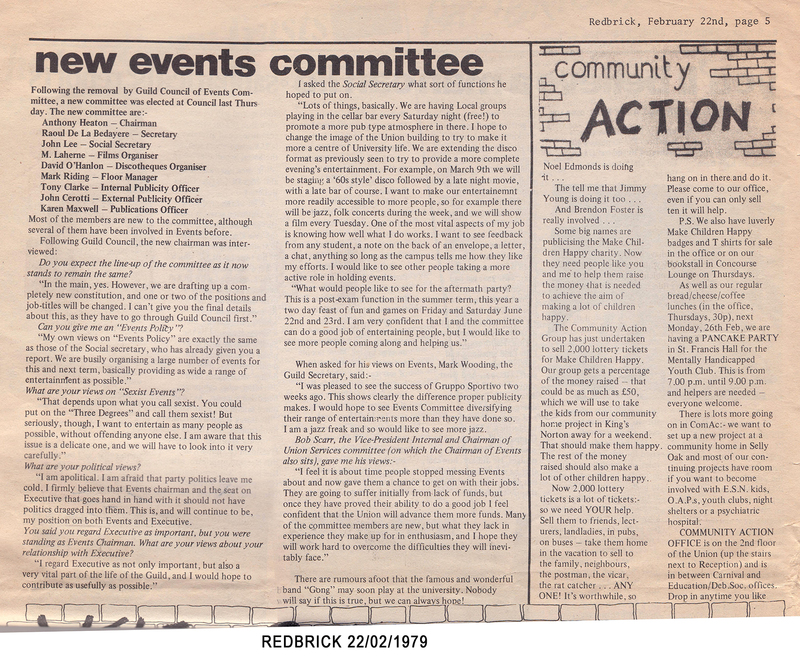 Before the close of Spring term I wrote a piece for Redbrick (attached) which attacked those who sought to turn Events into an adjunct of catering. The Executive were appalled: apparently it wasn’t done to to air your dirty laundry in public, but I neither knew or cared. Anyway it worked to the extent that the Executive agreed to fund a a major event at the start of the summer term. The hacks agreed to fund the new gig on the proviso that they had the final say on the choice of band. A bit of a problem because as largely postgrad old hippies they had no idea about this New Wave rubbish. So I went looking for bands and soon ran into two obstacles. From the promoters’ point of view B.U.G. S. was an unknown venue: it simply wasn’t on the university circuit. The second was that the Guild’s license was as a membership club and our President insisted on upholding the rule that only registered students with a Guild Card could be admitted. In those days all band tours were hugely subsidised by the record labels. 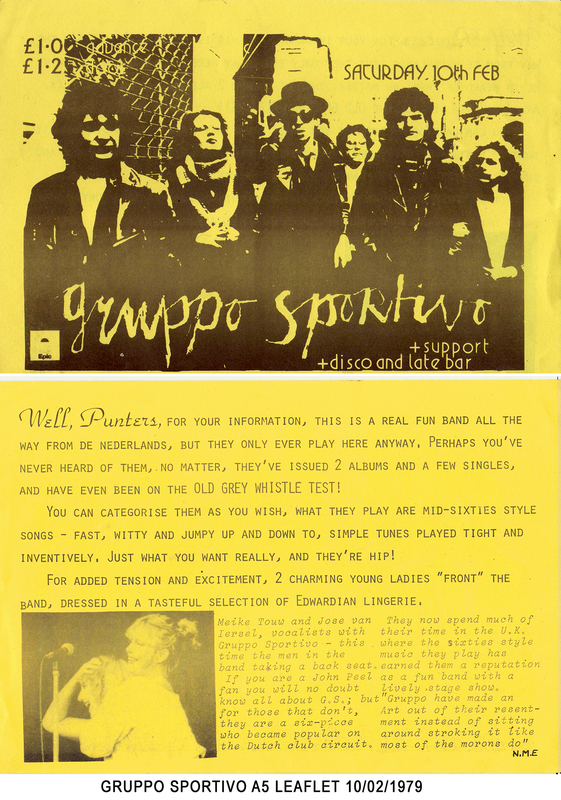 A gig which excluded the Midlands fanbase would be more likely to harm rather than help record sales. Lena Lovich: a charting and Top of the Pops power-pop star; the fee proposed I think was £400. Jo Jackson: a bluesy singer song writer who had just released an acclaimed album, which became a global hit. £500 I think. The Police: who at £250 were the cheapest and had just rereleased Roxanne for the third time. They were my recommendation – it was obvious they were about to break into the big time. Unfortunately, as I came to learn again and again, often the biggest international successes are the least well known on the way up. Quite logical really – they don’t appeal to enthusiasts and the mass market is unaware of what is up and coming. The hacks hadn’t heard of the Police so that was that. Squeeze: a New Wave ‘Power pop’ band were £400. Their first album had some exposure and the Exec hacks had at least heard of them. My enthusiasm was based entirely on the new single they were about to release, which was an obvious hit: ‘Cool For Cats’. the Executive agreed to let me book them and I went home for a nerve wracking Easter holiday. By the end of the break Squeeze were at number two in the charts. Events went into publicity overdrive but the truth was that Squeeze had joined the pantheon of acceptable New Wave bands students were fast latching onto. The gig sold out, apparently for the first time since Wings’ secret tour a decade earlier and we could have sold another 1000 tickets again. The sell-out hit the hacks like a bomb, especially coming after the Gruppo and Gong gigs. The Guild was thronging for the first time in years and now the hacks dared to believe the place could be turned around. The best result for me was that suddenly I could do no wrong and my words were gospel. Of course it was more luck than judgment, both that the single would be such a hit and that students took to the band itself. I’m glad though I didn’t realise it at the time anymore than did my gang or the hacks. I was on a roll and for the first and last time was about to experience the phenomenon that success breeds success. I thought I could do no wrong and nor did the Guild. 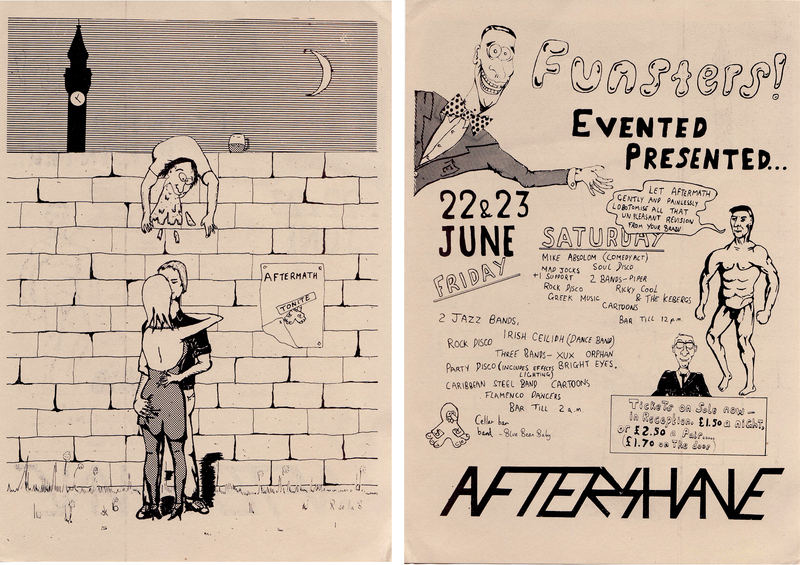 The final chapter of the year was the ‘Aftermath’ party, the two night event following exams. 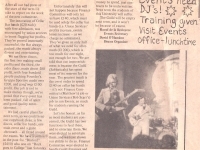 By complete coincidence another branch of the Gong family offered to play at the University for free in the summer of 1979. A happy coincidence since we had no money and their radical free idea was to tour Britain to play free gigs. The band ‘Here and Now’ were in truth the real Gong who had released the brilliant single “Opium for the People”, in contrast to the pretentious continental Pierre Moelen’s jazzy rubbish. So that was a pleasure to promote. Another coincidence, many of the band turned out to be pals of my uncle, an original psychedelic king of the underground, Simon ‘Stable’. A dreadful task was the two-day post exam party known as Aftermath, for which we had a tiny budget. 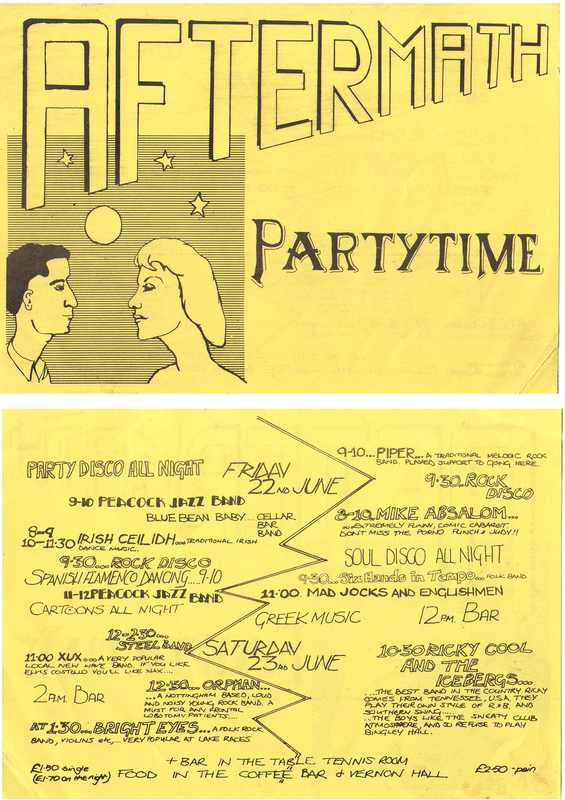 You will see from the attached leaflet the depths to which we plunged -I am happy to say I never witnessed the ‘Greek Music’ and ‘Flamenco Dancers’ . But the funny thing was – it proved truly popular. Not a sell-out but big and the students loved it. All they needed was an excuse to party – in truth they were their own entertainment. Now I am about to tell the tale of the next year in terms of the major band events. But in so doing I will miss out some vital themes, so though uninteresting to anybody who wasn’t there, I shall now set them out. In those days the Guild had a reprographics department complete with a full blown offset litho machine. I was and still am a useless artist but I spent countless nights over the next two years drawing tickets, leaflets and posters to promote the events. 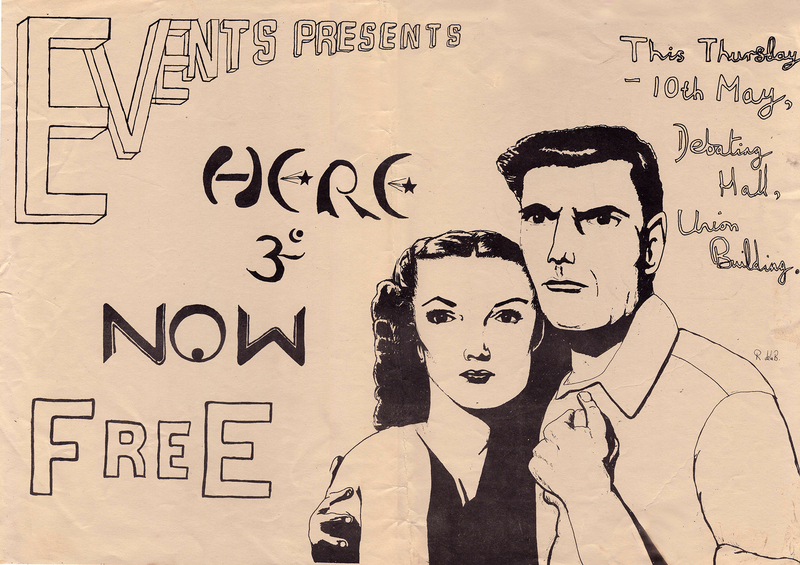 The Here & Now poster abd Aftermath leaflet are very representative of my rotring pen output at the time. Useless I might be but at least I realised the bands’ vibe and also the pre-Viz useless student ethic. A real artist came up with the hateful Events logo of a bulging eyed, armless gonk which I was obliged to include in my artwork to my shame. 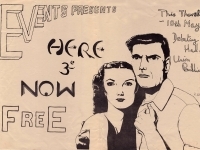 The Here & Now poster was a steal from a fifties science fiction movie ad. A common theme I used was of a boy copping off with a scantily clad girl student, on the basis that this was the main goal of an undergraduate. Eventually I discovered letraset. The main publicity materials were the ticket, the A5 leaflet and the A3 poster and I can only apologise for my abysmal artwork, if not for the irony. Historically Birmingham had been run by the temperance orientated Quakers, and still was. After WWII the city was a wasteland and Birmingham City Council gave two breweries, M&B and Ansell’s, the monopoly of the city’s bars in exchange for rebuilding the pubs. They also imposed their Quaker rules so that pubs closed at 10.30, not 11.00 as in most of the country. In the Seventies every pub in Brum served only industrial keg bitter of a type that is now virtually extinct. The Cellar bar at the Guild was one of only two or three places in the city serving real cask ale. That and the fact that the Guild, as a club, could obtain a late license on gig nights – maybe six nights a term – meaning the bars could stay open till 11.30, was a huge draw. The reality was that unpopular, unknown bands were effectively a front to draw in 500 or so hard drinking students, who may or may not stagger out of Mermaids or the Cellar bar to suffer 15 minutes of power chords. Unconsciously the Guild Execs had come to regard Events as a necessary but non-critical adjunct to hauling in the drinkers. An attitude which also created a strange business model by which the £1.50 ticket income had to account for the band’s fee as well as all the extra costs of publicity and staff overtime, whilst the increased bar income was treated as a windfall. This was a problem that persisted and plagued me throughout my era. Then along came Disco Dave. And he deserves a page of his own. 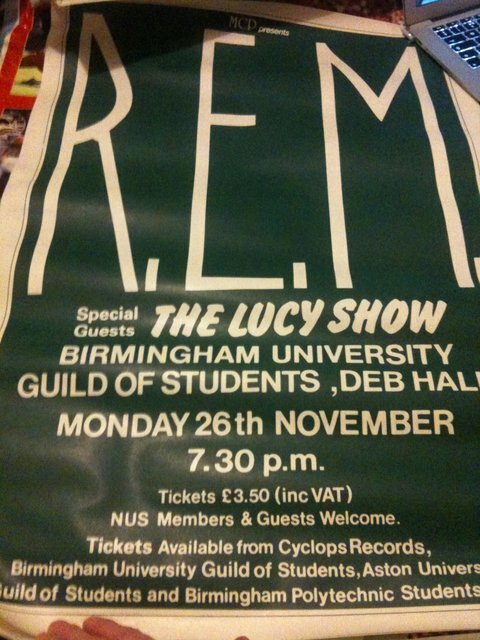 Jaki Booth was Ents Officer at the Students Guild in the 1980s and has sent this amazing poster in of the R.E.M. gig of 1984. Incredible to think of them playing at the Guild. I missed this gig (to young!). 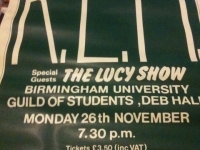 Our aim to build a complete list of gigs at the Birmingham University Guild. Here’s a start but we need your help! I think I saw AC/DC here as well,? Joy Division played their last ever gig at High Hall, Birmingham Uni on 2nd May 1980, immortalized on the LP Still. A few weeks later Ian Curtis committed suicide. I’m amazed at how much the musical landscape had changed in just a few short years. I have finally got round to rummaging through old diaries and boxes. I was the Ents Treasurer, Ents Chair and the Vice President Internal – who signed the contracts etc. So, this is a fairly full list of gigs at BUGS in the early 80s. 24/06/1983	King, Big Country (Aftermath ) BUGS [I think these aftermaths are a bit mixed up. I’ll try and investigate more. Fairport Convention played the Deb hall in ’78, and Lake Hall in ’79. Between ’77 and ’80 I also saw XTC, Darts, The Selecter, The Beat, Radiator, Lew LEWIS, Nine Below Zero, Sad Café,,Steve Gibbons, Renaissance, Five hand reel, Squeeze, Radio Stars, Little Acre, Ricky Cool and the Icebergs, Gordon Giltrap, The Pirates. All at Brum University as far as I remember. I’m sure there were loads more, but it’s all a bit vague. Great days. A mate of mine from Maths was in a local band called “Show Of Hands”. He was called Rob Lloyd & the band was “Show Of Hands. Used to a storming “Munsters Theme” as an encore. At some point 81-84 we had Culture Club, Aztec Camera at High Hall, Ten Pole Tudor supported by Thirteen at Midnight , Bad Manners. I found tthis site looking for answers. May have to return with more details. 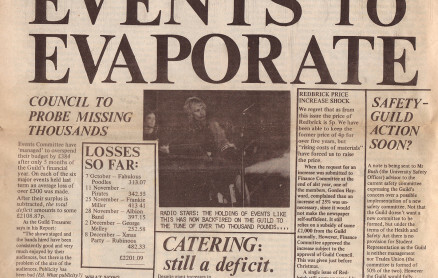 Slade played the Deb Hall and refused to leave the stage when there was a fire alarm 1979? Also Jeremy Taylor and Ralph McTell in the Deb Hall 8 March 1978. I think I might still have diaries from that time and will have a search through. I have a clear memory of the dread Vapors pulling a big crowd who stayed in the bars till the first chords of ‘Turning Japanese’ when the Hall quickly filled, only to empty again as soon as it finished. Also remember Dylan-wannabe Steve Forbert, TheCramps (excellent) and Lindisfarne, possibly the night before they played Knebworth and with trucks full of gear.